Ellms Family Farm offers family fall fun in Saratoga Springs, NY. Enjoy outdoor activities such as pick your own pumpkin from our pumpkin patches, the best corn maze in NY, fresh cider donuts, and over 30 family-friendly activities. 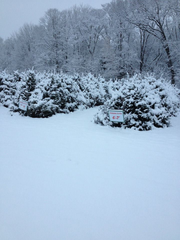 During the holiday season, you can also cut your own Christmas Tree at our Christmas Tree Farm. Come join in the fun this fall and make us part of your family traditions! Rate and review Ellms Family Farm in Ballston Spa, NY, United States! Share your experiences at Ellms Family Farm with your friends or discover more Local Services in Ballston Spa, NY, United States.